Lacey Duggan had never wanted to live on a ranch, but she had nowhere else to go at the moment. Luckily, she and her two brothers had inherited a ranch with an unusual will stipulation. Her brother Duke might have embraced the life, but she had no intention in doing so herself. She just wanted some time to get her future sorted out, some rest, and maybe some relief from stress. Unfortunately, spending time with ranch manager Quinn Solomon was anything but stress free. Quinn knew Lacey would only be at the house a short time, which was a relief. He had work to do there, and they couldn't seem to cross paths without sniping at one another. He wanted to limit their contact so he could focus on work, then get home to his daughter. Since his wife's death, his sole focus was on earning a living and making sure his daughter Amber was well cared for. The one thing Quinn and Lacey seem to agree on was putting aside their differences when Amber was with them. Then Quinn and Amber are forced to temporarily move in with Lacey. When they form a truce, they can no longer deny the attraction they have for one another. 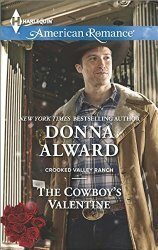 The Cowboy's Valentine is a romance between two individuals losing the fight against the attraction they feel for one another. I hadn't read the first book in the series. So when the sparks fly from page one, with the hero and heroine constantly bickering, it initially seemed out of place. However, I enjoyed seeing Lacey settle more into the realization that living on the ranch doesn't mean she has to work on ranch, and Quinn beginning to let go of his loss. I'd like to go back and read Duke's story, and look forward to the final of this trilogy.